Targeted at prototyping and for delicate rework, the Hakko FM-206 3-Port Rework Station is the next new product release coming from American Hakko Products (Hakko). Available as either an individual station (part number FM206-55) or in four standard configurations, the Hakko FM-206 is expected on July 5, 2011. The stand-alone FM206-55 will come with the 3-Port Station, the B2756 Tip Tray, and a B2419 Power Cord. 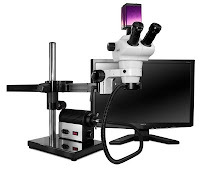 The four standard configurations (FM206-DSS, FM206-DTS, FM206-STA, and the FM206-DSA) each contain a combination of a soldering (FM-2027) and/or desoldering iron (FM-2024), tweezers (FM-2022), or a hot air pencil (FM-2029). 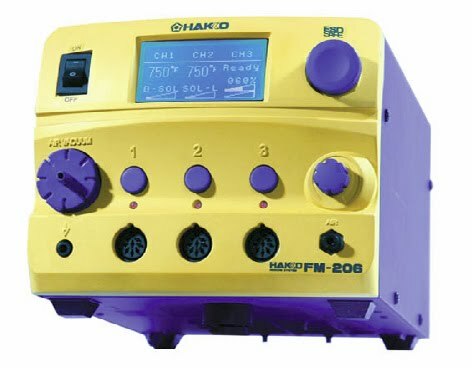 Additional optional handpieces are/will be available (including the Hakko FM-2030 Heavy Duty Soldering Iron to be released in the near future). One of the "coolest" features of the FM-206 is the "cool-down" mode available when using the hot air pencil option. To promote tip life, after you shut down the pencil, the software will do a 15-second purge of air to cool down the tip. We'll have further, detailed information about the Hakko FM-206 3-Port Rework Station after its release so keep coming back to The Q Source Resource and also check out our YouTube Channel for our "On the Bench" series of videos. To find out more about the FM-206, and how you can order yours, give Q Source a call at 800-966-6020. As mentioned in our previous post, "Hakko FA-430 Replaces HJ3100 Fume Extraction System," the Hakko HJ3100 is being replaced…but it's still an excellent fume extractor and QSource.com is offering the HJ3100 at an unbeatable price, and with a free filter adapter, while supplies last. 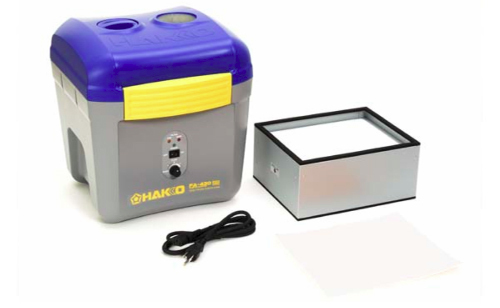 At a phenomenal savings of almost $100 off the regular price, the Hakko HJ3100 Fume Extraction System features efficiencies greater than 98% at 0.3 microns. The HJ3100 is designed for use at soldering stations to extract the contaminated air directly at the source. 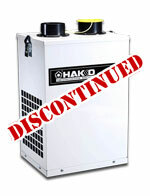 The HJ3100 and its replacement parts are available until current supplies are depleted. 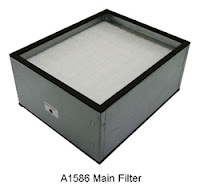 The free filter adapter (part number 999-241) lets the HJ3100 use the new FA-430's main filter (A1586) and pre-filters (A1585). The adapter simply drops into the HJ3100 and allows the FA-430's main filter to provide excellent filtration efficiency and increased airflow performance. 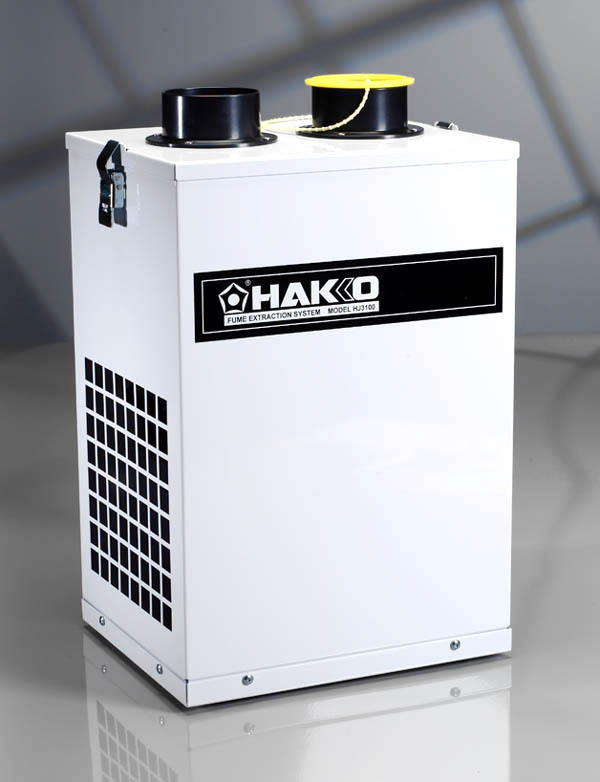 To order your Hakko HJ3100 Fume Extraction System with free filter adapter, or for more information, please visit our Web site or give us a call at 800-966-6020. Remember, supplies are limited so ACT NOW. There's no static in this announcement…QSource.com now offers the entire Static Solutions product line. If you're looking for one of their static control, clean room, or maintenance products, we've got it! QSource.com features Static Solutions products to meet needs in many areas. Personal grounding items include Heel and Sole Grounders, Wrist Straps, and Ground Cords. 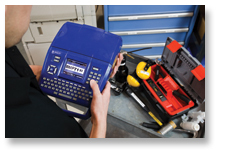 For testing and monitoring there are Test and Audit Kits, Test Probes, Meters, and ESD Monitors. Table and flooring solutions include ESD Table Mats, Dissipative Floor Finishes, Conductive Floor Paint, and ESD Floor Cleaners. 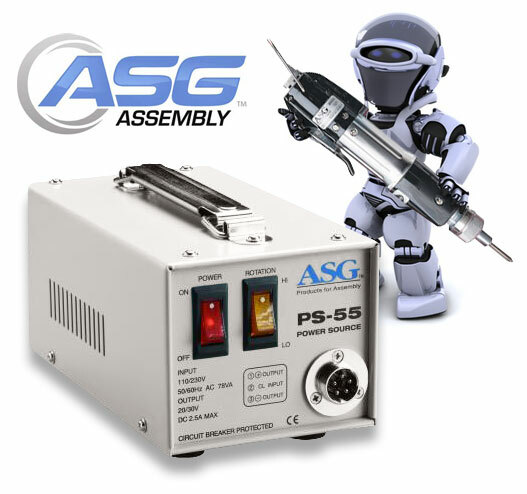 Check out the Static Solutions page on QSource.com to explore the complete line of products. Static Solutions, Inc. manufactures ESD-safe products for production, static control, clean room, static testing, data logging and sanitary maintenance. They are headquartered in Marlborough, MA, with manufacturing facilities in England. Cluttered, dirty, confusing, wasteful, and dangerous…not the adjectives you want used to describe your business. Implementing a Lean initiative, beginning with 5S, can transform your business into an organized, clean, efficient, straightforward, and safe workplace. 5S is a tool that can be used to create a foundation upon which a complete Lean initiative can be built. Mark Graban, founder of LeanBlog.org and a Senior Fellow at the Lean Enterprise Institute, believes "5S needs to incorporate Lean thinking…looking at providing a better workplace, engaging people in that improvement, providing more value to customers, and preventing errors." According to the Environmental Protection Agency (EPA) Web site, "5S is a system to reduce waste and optimize productivity through maintaining an orderly workplace and using visual cues to achieve more consistent operational results." 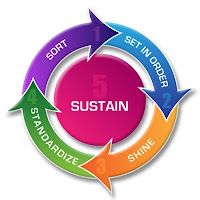 The components of the 5S system are: Sort, Set In Order, Shine, Standardize, and Sustain (also known by the Japanese words: Seiri, Seiton, Seiso, Seiketsu, and Shitsuke). The Japanese names are tied to initiatives that are mostly associated with Toyota (the Toyota Production System, for example), but the concept goes back even further to Henry Ford's CANDO (Clean-up, Arrange, Neatness, Discipline, and Ongoing Improvement) system, which he discussed in his classic 1926 book, Today and Tomorrow. Sort: The process begins by culling through everything in the target area, whether it be in manufacturing, an office, or a hospital environment, and eliminating all unnecessary items. Keep only the essentials and store or throw away the rest. The entire team should be involved in the sorting process so an accepted, general consensus about what is and isn't necessary can be reached. Set In Order: The next step is all about arranging the remaining items and creating an organized workspace. The straightening, labeling, etc. during this phase are all aimed at promoting an efficient workflow. There are many valuable tools and procedures that can be implemented to make this stage a success. These include painting or labeling floors to indicate specific work areas, using tapes and labels to outline where tools or other supplies should go, special bins to store supplies and for inventory control, shelving and cabinets to solve storage issues, and more. Shine: After the unnecessary items have been discarded, and the work area organized and made more efficient, then the cleaning process can begin. Sweeping, shining, and making the work area tidy helps workers to quickly recognize leaks, broken parts, malfunctions, etc. and, most importantly, it improves worker safety. This step in the 5S process needs to be practiced on a daily basis…workers need to make it a habit to clean the workplace before things get messy. Standardize: When the first three steps of the 5S process have been completed, attention needs to shift to creating a detailed procedure to standardize these practices. Because 5S is a visual process, some of the handy tools for this step include signs, checklists, charts, and scoreboards. It is this step that requires the most training and practice to promote the consistency needed for a successful 5S initiative. Sustain: Achieving success with the first four steps means nothing if the fifth step, Sustain, is overlooked. Maintaining the 5S process and creating good habits can be encouraged by visual reminders such as signs or posters around the work area. Regular meetings to review procedures and to discuss new issues will keep the focus on sustaining 5S efforts. Wilhelm urges that each "S" is important and that following the sequence is key. But, "Many people do say that 'sustain' is the most important, and you can make a good argument for that being true," she said. Despite the seemingly easy implementation, many 5S initiatives fail. According to an Industry Week article, "…the average lifespan of a 5S effort is a paltry one year." Why such a dramatic failure rate? Karen Martin, of Karen Martin & Associates (a Lean consulting firm), believes the two missing elements are often leadership and culture. "Japanese leaders are trained as coaches and Lean is seen as an overall plan instead of being done in a step-wise fashion as it is in the U.S.," she said. Martin further points out that in the book Lean Thinking by James P. Womack & Daniel T. Jones (considered the "bible" of American Lean philosophy), the words "leadership" and "culture" don't even appear in the index. Graban stresses there has to be a Lean spirit. "I think if 5S is done in the spirit of helping people improve their own workplace and engaging people in improvement then that's more in keeping with the Lean spirit," he said. "A bad system will defeat a good person every time," said W. Edwards Deming, a consultant of statistical control procedures for post-WWII Japan. Just because an organization implements a 5S/Lean program doesn't mean it's doing it for the right reasons or that it will lead to business successes. Martin points out, "There's a lot of what we call 'Lame' going on out there." She says the danger is that, "Organizations will hear about 5S and think it's a nifty tool to implement at their company without a deeper understanding of Lean. They need to understand that 5S is a countermeasure to solve specific problems, not a tool to be slapped into an operation for no clear reason." Graban shares an example of an accounting firm in the U.K. that made workers take all their family photos off their desks and put tape outlines marking where their keyboard and mouse should go. "How in the world is putting tape around your keyboard going to help you do a better job for your accounting clients. I would argue that it doesn't help at all." If an organization truly embraces the culture of 5S and Lean by providing proper training and sustaining the efforts on a daily basis they will see success. As Lester R. Bittel said in The Nine Master Keys of Management, "Good plans shape good decisions...good planning helps to make elusive dreams come true." Bad habits can bring disaster, but good habits bring great rewards. Wilhelm believes that, "The main reward of 5S is that an organized workplace is a prerequisite to improving flow, one of the main concepts of Lean." Martin says the rewards of implementing a 5S initiative include: increased productivity, boosted employee morale, cost reduction, heightened customer confidence, and quicker service. And Graban adds, "If you look at good applications of 5S they engage the people who are actually doing the work…that's where 5S becomes very powerful." Hakko has officially released the all-new FX-8804-CK Hot Tweezer Kit for the popular FX-888 Soldering Station and Q Source is now accepting orders! 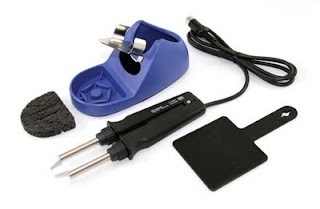 The FX-8804 uses the same tips as the Hakko 950 Hot Tweezer but has the proper connection and heaters to work with the FX-888. It provides the FX-888 with the option for adding SMT repair and the ability to rework passive devices. The FX-8804 Hot Tweezer prevents damage to surrounding components on densely populated boards by delivering heat directly to components. 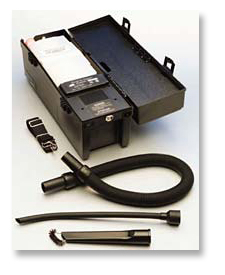 It can easily remove SMD chips and flat packs up to 25 mm. You can read more about the FX-8804 in our recent blog article and see it on our YouTube Channel and on our Flickr Photostream.